One of the many.....many things I collect & squirrel away for future gaming use is a good fantasy font. Now I don't use props all that often, but when I do I like to make them as good as I can. My handwriting looks much like it did back in 4th grade, so any written documents have to be be done on a computer so I can make them look as pretty or pretty ugly as needed. 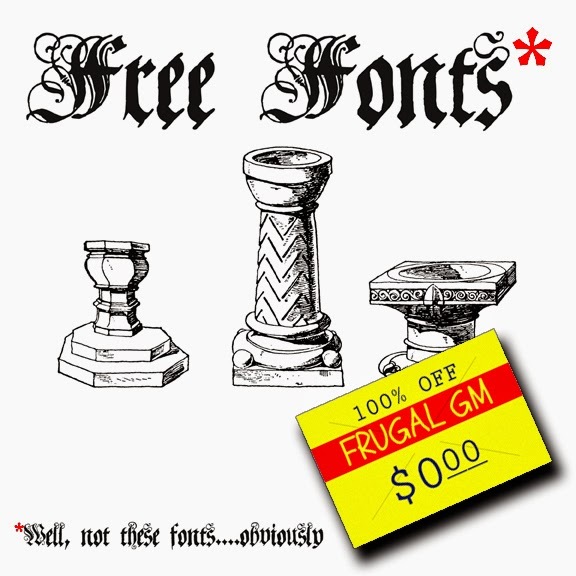 This week's Free GM Resource was a lead from the folks over at the Kenzer & Company forums. It is a large collection of Lord of the Rings fonts gathered up by Pete Klassen. The collection is pretty sweet. I've seen plenty of Tengwar fonts here and there, as well as a few Dwarven fonts, but I don't think I've ever seen any Hobbit fonts or the awesome "Runic" font, which is basically the Latin/Roman alphabet (what I'm using now) gussied up to look like runes.